Cambridge Solar use only the best solar panels that we know are manufactured to the highest quality. View the solar pv panel list or our full solar pv product page. If you want to find out more about the importance of quality in solar pv instalations take a look at our Quality Solar PV Installations page. For more information on how to differentiate between different panels take a look at our online guide: How do I choose between different solar panels? LG Solar, our most popular solar panel, are a leading global manufacturer of high quality solar panels. These robust and well designed panels are excellent value and come with a black frame as standard. Find out more. Upsolar is a leading international developer and producer of high quality solar PV modules. Upsolar's premium mono and polycrystalline modules are a result of the company's "Excellence at Each Step" approach similar to that used by Apple. UpSolar has been recognised by numerous international awards as well as the German equivalent of Which magazine, OKO-TEST. Find out more. These panels are used in specific, bespoke situations where our main brands, LG and Upsolar are not suitable. Panasonic are a premium quality, high efficiency panel. Untill April 2012 they were branded as Sanyo -the product is identical only the name has changed. They are a unique high performance panel that is ideal for small roof spaces or non-optimum locations. Find out more. 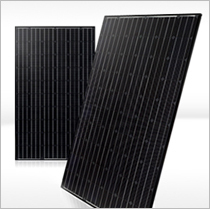 Solar Frontier, our thin-film solar panel has significant advantages over traditional panels. This includes a higher output ratio (kWh/kWp), a lower carbon footprint and a great unifrom aesthetic. Manufactured in Japan these are great for installations where space is not an issue. Find out more. Hyundai are a popular panel, especially with it's 'all black' panels with black frame and backing sheet. Hyundai are a leading global manufacturer offering outstanding value for money while maintaining excellent warrenties and great quality. Find out more. Kyocera produce highly efficient, premium range solar pv panels that are very well engineered. This ensures a high power output from a small panel which is useful for smaller installations. Find out more .